Curtis Roth is an Assistant Professor at the Knowlton School of Architecture and a 2015-2017 resident fellow of the Akademie Schloss Solitude in Stuttgart. Prior to his current position, Curtis was a partner of OfficeUS, an experimental architectural practice founded within the US Pavilion during the 14th Venice Architecture Biennale, and the Knowlton School of Architecture’s Richard W. Trott Distinguished Visiting Professor and Howard E. Lefevre Emerging Practitioner Fellow. He investigates architecture’s processes of cultural, economic and juridical valuation after the internet, through diverse media productions including movies, video games, internet micro-economies, drawings, texts and occasionally irl stuff. 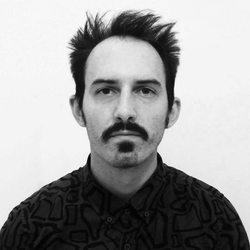 His research and design work has been published in Volume, PIDGIN, PLAT, Graz Architekture Magazin, and Kerb, among others, and has been exhibited at the 2014 Venice Architecture Biennale, at the Archivo Diseño y Arquitectura in Mexico City and elsewhere.